Isleworth Boardgamers: We had a right time of it..
We had a right time of it..
Me for a few weeks following Dan's marathon stint, RESPECT of the highest order. His thought process was fascinating. I love finding out what makes people tick and Dan is a great case study. The way he plays is always impressive, the speed of his insights scary! 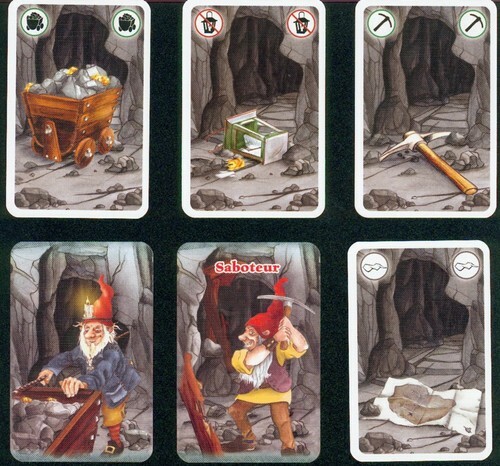 I recently hosted a learning game of Andean Abyss with Dan. What a game. Thankfully it comes with a run through of the game which we tagged along with to learn various new mechanics and intricacies. That Dan sussed it all out quicker than me was a given. That he was able to supplement my learning was invaluable, cheers fellow! Anyway, thought I'd spend some of the blog looking at my week's gaming. Following only my second visit to the club last week for 2015 it was nice to log my plays on the Geek. 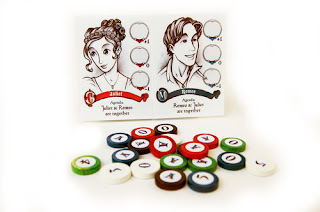 I'd enjoyed Sons of Anarchy and it was great to get another play of Fresco as well as learn Too Many Cinderellas. I managed to get some thoughts down on Sons of Anarchy for the blog, a useful exercise as my amnesia kicks in so quickly nowadays. Thursday and time to spend some time with Josie, my 12yr old. She doesn't mind humouring her old man with some gaming from time to time and she asked if I fancied playing Chateau Roquefort, but of course! 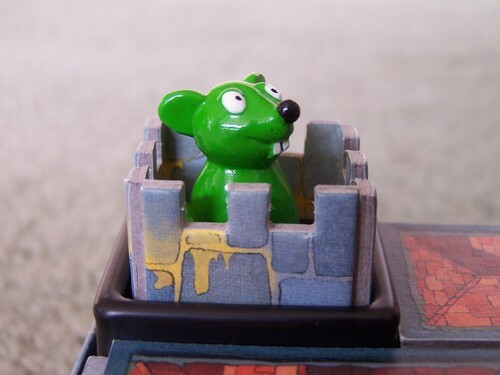 Get your mice scurrying over rooftops for cheese, this is perfect for youngsters. She thrashed me in the first game but revenge was mine in the second, mainly because I was able to hijack her mice and off the roof they tumbled, good fun. Also decided to order some more Artscow baggies as Fresco badly needs one.. as if the 101 I've already got weren't enough! Made the order up with Race for the Galaxy baggies and some personal ones. Friday, and I had Tom over during the day for some gaming. He'd asked me about what I'd fancied and so Fantastiqa got it's first outing. The rules had been pretty heavy but once you get playing the game they all make sense and it's really rather straight forward. Ultimately a deck building race game there are some interesting mechanics and the artwork/theme is impressive throughout. Next up was his Kingdom of Soloman. A worker placement, area control/influence/enclosure, network building treat, this turned out to be very impressive. Tight, some interesting decisions to be made and plenty of interaction as well. Has gone on the Hora wishlist! 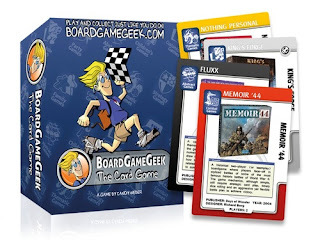 For our last game we played the BGG Card Game and Tom also enjoyed it, see below for more info. So, a good day Friday all in. 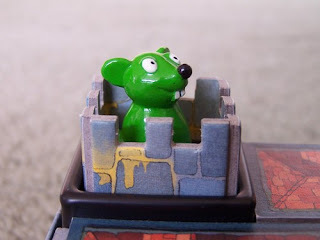 Over the weekend I added some more games to my Essen geek list, up to 40 items now. As it happened I also booked the ferry for my third sojourn. Super group this year with James, Jon and Paul D joining me. Also confirmed the hotel as we're returning a day earlier than we did last year. Bring it on!! Also over the weekend I'd unpacked my copy of Aquasphere from last year's Essen as James had invited us over for games and it looked as though we'd get a chance at this Feld at long last. As it was Jon realised his family were away and so he could have people over to keep him company. James got swindled into giving me a lift over - more alcohol allowed - and we were joined by Noel too. 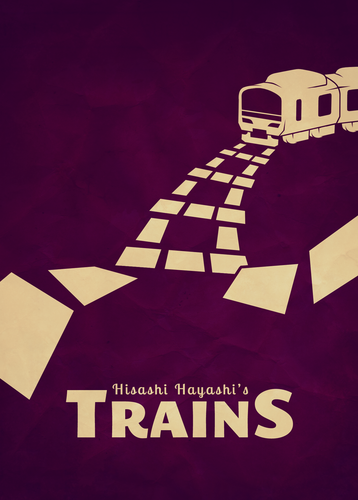 Monday's games kicked off with Isle of Trains which I like a lot. Then a peach of a game of Railways of the World as I prefer to call it, the England and Wales map. It was a belter of a game with James beating me by 1 point, the others going for interaction rather than victory. We then sneaked in a play of 7 Wonders including the Cities expansion and I was crap but never mind. Another good evening's gaming! On Tuesday I took delivery of some promo cards that feature Joel Eddy, a video reviewer on the Geek who I'd supported on kickstarter. There were four cards and one enters my collection as part of the Viticulture/Tuscany game. Another will go to Mr Williamson as it's for Fleet - not a game I ever fell for in three experimental plays! - and another to James as it's for Alchemist, although I guess he'll be trading that on pretty soon. The final card is for Mage Wars and it's yours if you ask of it! I also received a kickstarter game that I had almost given up on. It was supposed to be delivered last November so to receive anything was a bonus. It's called NGo: New Global Order and I think that I have lost any interest in the thing! It arrived in a tube and has a load of 3-D plastic pieces that are of poor quality but that's nothing compared to the card deck, have produced better on my £25 printer.. ah, the joys of kickstarter. Could well be one of the worst campaigns I have backed. Never mind, it's only money! After dinner had a quick game of chess with Basti. I'm still useless at endings but managed to win regardless. Must get him to play more over the summer. The week finished Wednesday with a play of the Polish Ark of Animals with Josie. Quite a nice tile grab of a game. Load up that ark but be careful, the herbivores will eat the grain, the carnivores the herbivores and you have to balance the ship too, naturally. On the way to IBG I stopped in at Lakeside where our friend Philip has been sectioned. He looked okay but was far from being himself. His concentration has been badly affected by his meds but at least he's calm. It's very sad to visit him and I feel as if he's in for a long period of recuperation. His bipolar illness has hit him very hard this time, especially such a long time after his last episode some 10 years ago. I was grateful to everyone at the club to take my mind off his predicament for a while. Will be visiting him again Monday though. Right. IBG stuff.. This week saw another good attendance with a newbie, Philip from Narwich, and a returning face from aeons ago, Raj. Welcome returns also for TomTom and John. Then the usual rabble were there too: James II, David, James, Jon, Dan, Paul Agapow, Philip and Rachel. 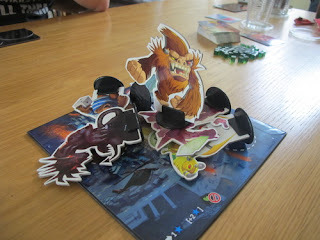 And a right old mix of stuff hit the tables, all featuring a plethora of cards with only two exceptions. Let's see how it all took shape shall we? Much to the horror of the cynical Agapow the BoardGameGeek the Card Game was first up. Neil introduced and taught this sweet set collection filler to James II, David, Tom and Phillippe. Everyone starts with 4 games in their hand and each turn sees them either taking a new card or playing cards into their tableau. That the cards feature board games we all love, on the whole, makes it a good addition to a collector's collection! Before taking an action you my trade a card with an opponent although all negotiations we had lead nowhere. Then it's action time. You can take a face-up card from one of four on the table, possibly having to 'buy' it with another card if it's marked as 'rare' or 'favourite', or thrifting it blind from the draw deck, or holding a maths trade for it: each player gives up a card from their hand and one is added from the deck, then each in turn select one to keep. 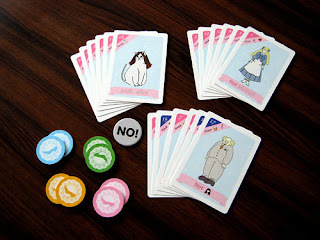 The alternative action is to play cards into your tableau which is the only way to score. 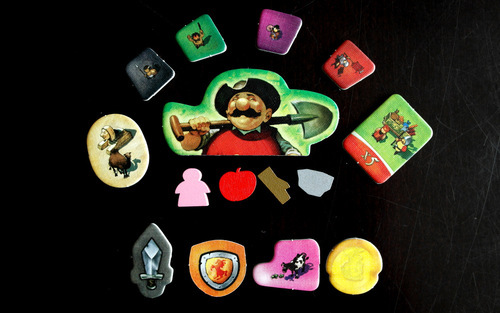 You can either playing matching types of games, Family, Strategy, Abstract, etc., or a collection of different types. The former scores by squaring the number of cards, the latter in the triangular number sequence. And that's it. 80 cards, the end card gets shuffled into the final 10 of the deck and off you go..
Our game featured plenty of maths trades with everyone cautiously holding onto their hands for many rounds. Eventually David chose to reveal his strategy placing down a nice set of Children's Games which he followed with a Family Games Set. Tom placed a couple of sets too, Strategy and Abstracts I think they were, before Neil managed a 6 card set of Customisable Games. James and Philip then both put down full 8 card Collections but despite a few more bits and bobs being played it was down to me to place another 4 card set of Children's Games and a 4 card Collection, making hay before the game's sudden end hit. Next up for me was Imperial Settlers. A game I collected for Dan at Essen last year and managed to get the illustrious designer Ignacy Trzewiczek to not only autograph but also to draw one of his infamous cows on the rule book! I have to say I'd avoided it purposefully to date but having now given it a go it was another great experience. I really can't give you much detail here. Dan certainly showed us how the game ought to be played but we all got it after a couple of rounds. Certainly up for another play of this some time. Jon Wooden; Trains. They're inseparable! So here he is to report on the latest round: Phil had played twice before, and didn’t take too much persuading to try to hone his skills further. Rache had never played before, but is gloriously optimistic about most things, and David had played Dominion so had no problem picking it up. The 3 newer members of the party were very excited about playing on the board, that they instantly started laying track and building stations like some gung-ho 19th century American pioneers. All of them picked up a route bonus, and were happily wending their way into each other’s territory, picking up city points as they went. Jon had opted for the ‘lay track into the remote locations in a circumspect manner whilst trying to collect enough booty to buy a juicy stadium or two along the way’ strategy, which was stymied slightly by the speed at which the game was likely to end. 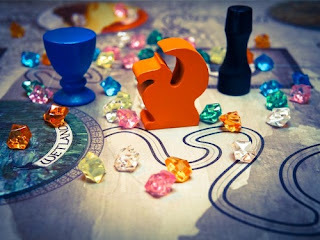 Indeed, Rache ended it by laying her last track, and when the points were totted up, it was very close, with Jon and David tying for first place having pursued very different strategies. Great game! David 38; Jon 38; Phil 34; Rach 30. 'Orléans with James, John & Tom. 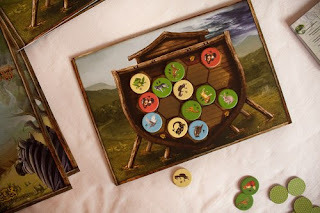 As I've said before, Orleans is a curious experience for me: it contains almost everything I hate in a game - point salad scoring, building stuff to build stuff, a weird resource subsystem that barely interacts with the rest of the game, stuff and stuff and stuff ... but it's a game that I enjoy immensely. Paul "Boardgameguru" Lister once praised another game by saying that even if you lost, you felt that you'd achieved something. Orleans gives me that feeling. Moves fast & good fun. Over on another table they all looked pretty glum until I realised why. Here's Mr Wooden to take us through Gloom. 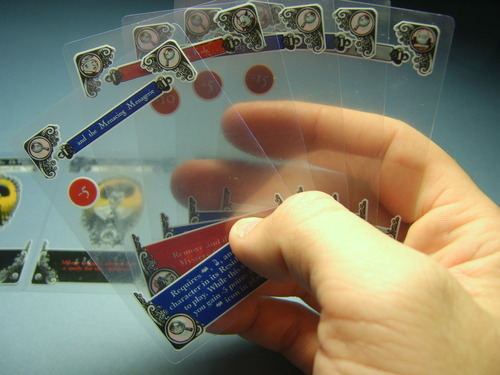 This game has an innovative mechanism of using see-through cards that can be laid on top of one another to modify their scores. This should definitely be used in other games. The game itself is not so much of a game, rather a story-telling experience, where players play cards on their own and each other’s families in an attempt to make themselves as miserable as possible, and others as happy as possible. Characters are systematically killed off, and when one player’s family is entirely RIP then the game ends and scores are totalled. The fun of it is in the storytelling – explaining how your brattish 8 year old daughter was somehow chased from the park by poodles, only to end up turning the corner and being eaten by a bear. Or how a daring circus-performer became hideously deformed, only to overcome all odds to find his true love and get married. 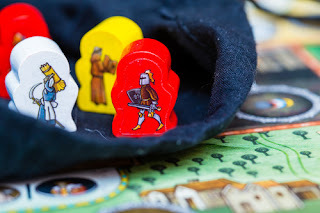 Following Imperial Settlers was the ever brilliant Council of Verona. Opting to keep Romeo but also Rosaline, whose agenda is to keep the lovers apart, I thought I might be able to scupper everyone else's plans and spring her late taking 4 points and winning. I managed to do the latter just fine, collect my 4 points. That at least three others outscored me meant I felt even more of an idiot than usual! Top game. Time for another pint then back upstairs for Saboteur, one my children's faves. Being dealt a saboteur card was no surprise but discovering that James II was the other one with only three turns having been taken meant it was going to be difficult hiding my role for long. That the four 'goodies' all sat in a line meant they had plenty of time to construct a useful tunnel. Added to that the map cards all came out early and two of the confirmed where the goal was early too. Then Tom came in with cave ins clearing the path and victory was complete for the goodies, bum! As it happens, Phil was knocked out early, James got close to 20 points and was then taken down, whilst newcomer Philippe stood tall in Tokyo, destroying Rache and Jon with a final flourish. 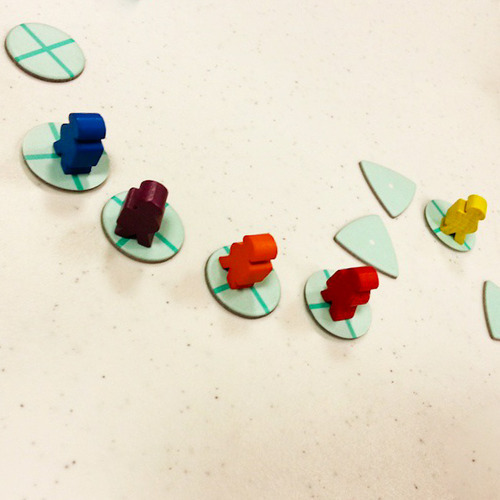 Awesome stuff – definitely a game that needs an IBG resurgence…..
My final game of the evening was another run out for Too Many Cinderellas. This is simply ace and just when you think you know what you're doing your choice of Cinderella gets 'mullered' for want of a better description. Tom, Dan and Philip all got an early win and then Tom and Dan were up to two each before I decided I really must buckle in and took the next two 'frames' on the trot. The decider went to Tom, poor old Prince Charming, fancy ending up with him! Not a lot I can tell you about the tile laying fest of Carcassonne between Tom and James, I guess one of them won, oh yes indeedy!